Sage has performed and recorded with many different musicians and groups such as Sage Reynolds Quartet, Sienna Dahlen, Stars, Amon Tobin, Ismail Fencioglu, Kaba Horo, Sean Craig Quintet, Michel Berthiaume Quintet, Rita Chiarelli, and Lenya B. He is currently collaborating with local bassist/composer Miles Perkin in the organization of “Mont-Royal Composers Forum”, a project that showcases new and adventurous original music. 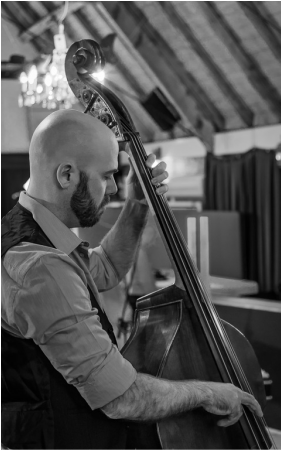 Other musical activities include studio session work (with performance and composition on The Sean Craig Quintet- Under Glass (Ora Records), frequent freelance gigging, the instruction of private students, and jazz combo coaching at The McGill Conservatory of Music. Sage was awarded the “Prix Étoiles Galaxie de Radio-Canada” at the 2005 Montréal International Jazz Festival for his compositions “Saturday Afternoon” and “On the Wall”. In October 2005 his quartet opened for John Scofield at one of Montréal's premier venues, Spectrum. In addition to his work in the Province of Québec, Sage has performed elsewhere within Canada’s borders, including concerts in Thunder Bay (Ontario), Ottawa, and Vancouver at The Vancouver International Jazz Festival. He has performed internationally in locations such as Alaska, Central America, South East Asia, New York, NY, Mérida, Mexico (at the 2005 Mérida Jazz Festival Internacioal), and Austin, Texas at the 2006 Folk Alliance Conference. Sage's first CD as a band leader, Sage Reynolds- On the Wall, was released on Effendi Records (Montréal) in September, 2006.